Romtec, Inc. is excited to announce the addition of hand-wrought log pavilions, tables, and benches to its product offering. Romtec is a national designer, manufacturer, and installer of public restroom buildings. The new log products are not only stylish but utilize sustainable construction materials and artisan builders. 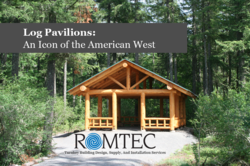 Romtec has long produced parks and recreation structures like concession buildings, kiosks, and storage sheds. With the summer construction months ahead, adding log pavilions, tables, and benches to this list creates an impressive breadth for retailing to city, state, and federal parks across the country. The new log products are not only stylish but utilize sustainable construction materials and artisan builders. A primary concern with using logs as a construction material is the conservation of natural resources. Green building is a growing focus in the construction industry. Their removal is also an important aspect of forest management. Romtec employs Oregon craftsmen who, using remarkable ability, create seamless notch joinery for log tables, benches, and pavilions. The Douglas Fir logs are hand peeled and sealed with Cabot Natural water-based sealant to ensure their longevity. Romtec sells pavilions in sizes up to 35 ft. by 45 ft. that can include log tables or benches in the design. The handcrafted structures are sustainable and iconic options that characterize the pioneering spirit of the American West.